If you are using quattro LNB, you have 4 cables (V/L,V/H,H/L,H/H), connect the right one to TBS6909 like the above picture ( input 0- input 3 should be connected to V/L,V/H,H/L,H/H respectively). If you are using quad LNB, you can directly connect the 4 cablesto the 4 ports of TBS6909. If you are using single C or Ku band, then two inputs are enough, you just need to connect the cables to input 0 and input 2 to provide V and H signal. If you want to use DiSEqC with TBS6909, you could use this mode. 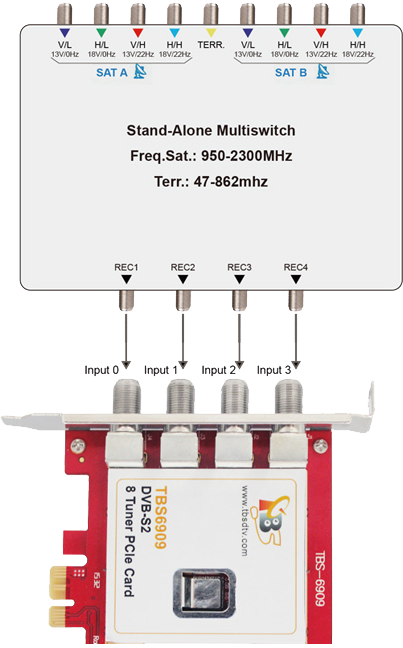 In some case multiswitch have more than one satellite input, need to choose the satellite first.